Starting out in the world of UX design can be a scary thing. There is so much to learn and so many different avenues you can go down. Just thinking about where to start can put you off before you’ve even begun. But there is hope. Sometimes you don’t need to create the next Airbnb or Uber. Simple app ideas for first time designers allow you to slowly work towards something bigger. UX design is a marathon, not a sprint – so pace yourself. It’s tempting to dive into your prototyping tool or image editing software and start crafting. Maybe you have a thousand ideas whizzing around your head. 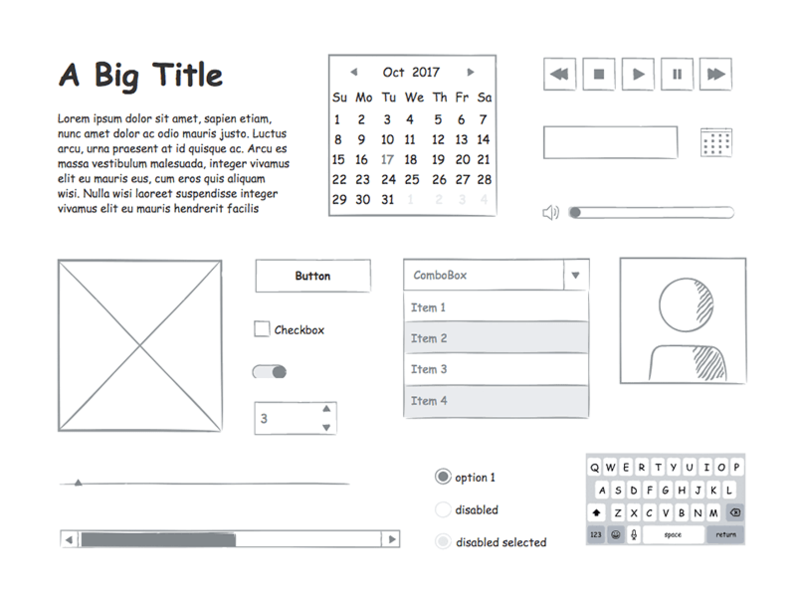 As a first time designer, you’ll need a set of tools to help you create your interactive wireframes and user experience designs. A designer really is only as good as the tools they use so stocking up on design resources can set you right and have you designing like a pro in no time. Thankfully, we created an extensive list of the best free app design resources for you. An idea will fall flat if it isn’t properly thought out and planned meticulously. The devil is in the details, after all. And simple app ideas are no different either. That’s where sketching comes into play. Sketching is a great way to explore any idea fast and get your thoughts from your head onto paper or directly onto the computer. Skip putting pencil to paper and create your sketches directly on your computer with our sketching widget kit! Now, let’s take a look at simple app ideas for first time designers – and remember, these can all be created in Justinmind! Prototype your simple app ideas in Justinmind. Download now. Word on the street is that millennials spend a big part of their work day stressed out by their finances. How fitting then would it be to create a personal expenses app so people can keep track of their spending habits and start saving. You can take inspiration from the big boys in personal finance such as Mint or Wally or take a gander on dribbble – Ivo Dimov has created a slick and visually pleasing app in the picture above. A common feature in personal finance and expenses apps are sliders – to determine how much your budget is for the week or month, for example. In Justinmind, it’s really easy (and fun!) to create a custom slider. And once customized to your taste, they will look right at home in a personal finance app. We love taking photos. Lots and lots of photos. So how fun would it be to create your own Instagram style photo sharing app? 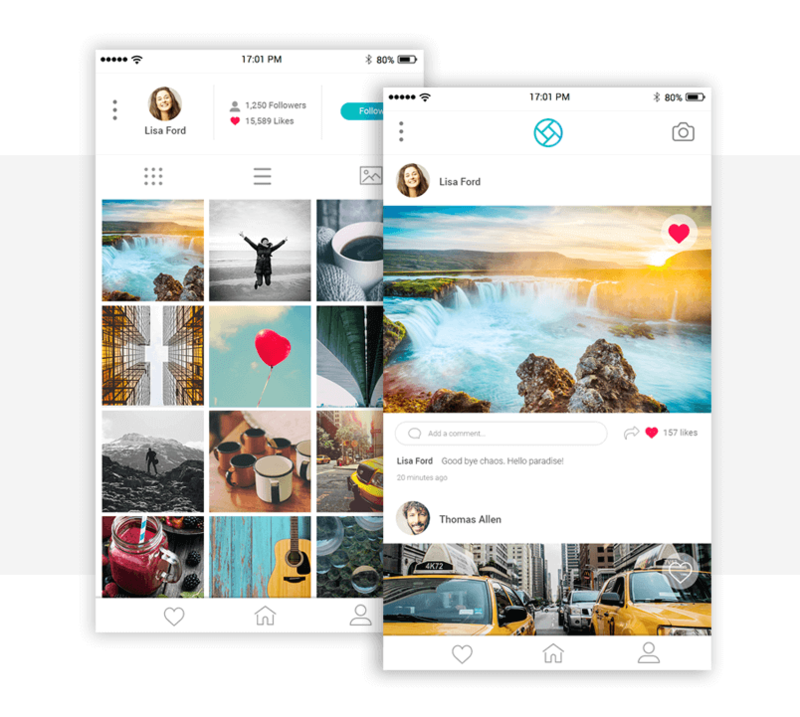 There’s a lot of interesting functionalities that you can play with when creating a photo sharing app like navigation bars, profile pages and layout styles. Plus, you get to play around with photos and image editing. Take a peek at Unsplash if you want to use cool, royalty free photos. We even have a easy to read walkthrough of how to do that in Justinmind. Weather apps are really simple and a great starting place for newborn designers. Since they display minimal information, the key to getting a weather app right is in the UI design. 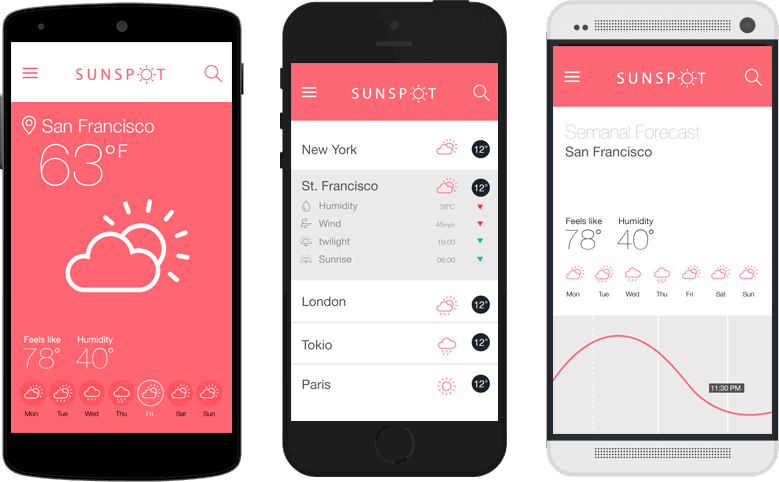 A lot of beginner coding courses show you how to create a weather app because you can put the basic fundamentals into an app – UX design is no different. With a weather app, there’s the opportunity to think about the right color palettes, what sort of functionality it should have and how the information can be displayed in the best way possible. Check out our interview with Yael Levey, the creative director behind the world’s most used weather app, BBC Weather, for real life tips from an expert. 85% of consumers love an app over a website. If that’s not reason enough to get your head around designing an ecommerce app then what is? Ecommerce apps are popular and knowing how to make one means you’ll be able to get your head around really important aspects of UX design. To prepare, you can research user flows, journeys user personas and effective call to action buttons. Put your research into practice through prototyping your own. Since the point of these apps it to get consumers to buy, understanding these fundamentals is essential because they all contribute to the overall experience. Even though the ideas above are for first timers and relatively simple, it’s still beneficial to add interactivity and animation to your prototypes and UX designs. Animation can be used to grab the attention of your users as well as reduce frustration and boost the UI. UI animations are also playful but be cautious, too much animation can exhaust the user and become cumbersome to the user experience. Animations should be about enhancing, not distracting. With that in mind, try and see if you can slide any of these four UI animations into your simple app ideas for a little bit of extra flavor. It’s easy to become overwhelmed as a newbie in UX design. Small steps and a lot of patience can result in big gains later down the line. But by completing a few of the simple app ideas for first time designers above, you can gain an understanding of fundamental UX design principles as well as the opportunity to experiment, have fun and create awesome designs. Enjoy!